Financial Advisor Credentials: Real or Fake? A certification or designation is a credential that is supposed to mean a financial planner or financial advisor possesses specialized knowledge. The advisors spent hundreds of hours studying and successfully passed a real examination (proctored, classroom, timed). For example, a Certified Financial Planner™ (CFP®) is supposed to be a financial planning expert. Most investors assume the credentials are real or the advisors would not be allowed to use them. This is a bad assumption. 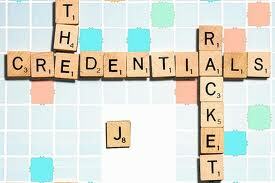 There are no rules that regulate credential quality of disclosure. In fact, there is a good chance that advisors who have exceptional numbers of letters after their names are using a deceptive sales tactic. They hope investors will assume they are experts even though they did little or nothing to obtain the credentials. Seniors are particularly vulnerable to these assumptions. They have to be more careful than other investors because several fake credentials target them and their assets. High quality financial advisors do not need deceptive sales tactics. They have spent years acquiring legitimate credentials, experience, and specialized knowledge. However, low quality advisors have to compete with high quality advisors. Many of them are ethically challenged so buying fake credentials is not beneath them. In fact, they buy these credentials to deceive investors into believing they are more knowledgeable than they really are. Paladin Advisor Research (www.PaladinRegistry.com) provides a free easy-to-use tool and database that helps investors identify advisors who use this deceptive sales tactic. You enter the certification in the Paladin search engine and view a one-page report that describes the credential. The Paladin Research service also produces a peer group quality rating that helps you compare different credentials to each other. There is a red flag rating for scams, a No Stars rating for discontinued credentials, and One to Five Stars for the remaining credentials. Fake credentials are a deceptive sales practice. Exclude any prospective financial advisor who uses this form of deception from your selection process. Immediately terminate a current advisor who used deception to gain control of your assets. Do you really believe you can trust these advisors to do what is best for you? Of course you cannot trust them. They put their financial interests ahead of yours when they decided to use deceptive sales tactics.